Whole Foods Market is America's healthiest grocery store who seeks out the finest natural and organic foods available, maintaining the strictest quality standards in the industry. Whole Foods Market opened its doors in Austin, Texas in 1980. Today, they are the world's leader in natural and organic foods, with 440 stores in North American and the United Kingdom. Considered America's healthiest grocery store, Whole Foods is driven by their mission and core values to sell the highest quality natural and organic products available, satisfy, delight and nourish their customers, support team member excellence and happiness, create wealth through profits & growth, support local and global communities, practice and advance environmental stewardship, create ongoing win-win partnerships with their suppliers and promote the health of their stakeholders through healthy eating education. 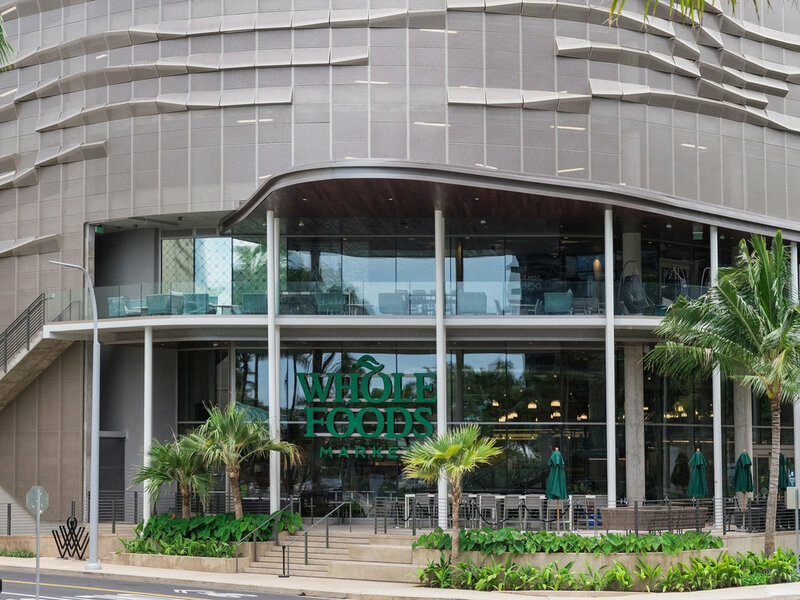 The 72,000-square foot, 2-level space features over 900 unique locally made, grown or raised in Hawaii products. Dining selections can be enjoyed on the go or at the indoor and outdoor seating areas. The store décor pays homage to the island's community, culture and beauty. Local Produce and Floral – Over 60 local suppliers make up the produce and floral section of the store. Guests can enjoy the made-in-house Ko Hana Heirloom Sugar Cane Juice. The produce section will only carry non-GMO papaya and corn. Local Meats – At the meat department, explore specialty cuts and marinade flavors like shabu-shabu, yakiniku, curry, huli huli, and teriyaki. Other highlights include the local grass-fed beef from Big Island Beef, market made sausages and bacons and in-house dry aged beef steaks that are cut and trimmed daily. Selection of meats are sourced locally from multiple ranches all over Hawaii. From Block to Bowl – A large selection of the local fish is purchased daily from one mile away at the Honolulu Fish Mart. Guests can enjoy the poke bowl pop up bar that features 7-15 varieties of poke and options to customize with toppers such as fresh fruit, veggies, nuts and seasonings. Largest Hot Bar in the Region – Spanning over 2 bars featuring 43 hot wells, guests can enjoy everything from a large variety of smoked meats to a wide selection of mac & cheese's including vegan mac, pork belly mac, roasted tomato spinach mac, jalapeno mac and brisket mac. Sit back and relax – Come in for a culinary experience at the bar where you can enjoy exclusive beers from Waikiki Brewing along with the 24 total beers on tap. Pair your favorite brew with menu options such as tempura, yakitori, the Tonkatsu Burger or the Kalbi Glazed Burger.